3.02.1 Kindergarten: At least four doses of Diphtheria/Tetanus/Acellular Pertussis (DTaP), Diphtheria/Tetanus/Pertussis (DTP), or Diphtheria/Tetanus (DT pediatric) vaccine; at least three doses of Polio vaccine; two doses of MMR (measles, mumps, and rubella) vaccine; three doses of Hepatitis B vaccine; one dose of Hepatitis A; and two doses of Varicella (chickenpox) vaccine. 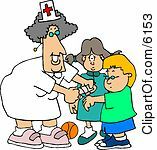 A medical professional’s [medical doctor Agency # 005.15 ADE 302-2 (MD), advanced practice nurse (APN), doctor of osteopathy (DO), or physician assistant (PA)] history of disease may be accepted in lieu of receiving Varicella vaccine. No self of parental history of varicella disease will be accepted (See Table I). Exception: If a student has previously received two doses of measles, one dose of mumps and one dose of rubella before January 1, 2010, the doses will be accepted as compliant to immunization requirements and 2 MMRs are not required. 3.02.2 1st through 12th grade: At least three or four doses of Diphtheria/Tetanus/Acellular Pertussis (DTaP), Diphtheria/Tetanus/Pertussis (DTP), Diphtheria/Tetanus (DT-pediatric), Tetanus/Diphtheria (Td-adult) or Tetanus/Diphtheria/Acellular Pertussis (Tdap) and one dose of Tdap for ages 11 years (as of September 1st each year) and older or 3 doses for unvaccinated persons 7 years of age or older (including persons who cannot document prior vaccination); at least three doses of Polio vaccine; two doses of MMR (measles, mumps, and rubella) vaccine, two or three doses of Hepatitis B vaccine; one dose of Hepatitis A for First Grade; two doses of varicella vaccine; and one or two doses of Meningococcal vaccine with one dose for 7th grade and a second dose of Meningococcal vaccine at age 16 years (as of September 1st each year). However, if the first dose of Meningococcal vaccine is administered at age 16 years or older, no second dose is required; or if not vaccinated prior to age 16 years, one dose is required. A medical professional’s [medical doctor (MD), advanced practice nurse (APN), doctor of osteopathy (DO), or physician assistant (PA)] history of disease may be accepted in lieu of receiving Varicella vaccine. No self or parental history of varicella disease will be accepted. (See Table I). Exception: If a student has previously received two doses of measles, one dose of mumps and one dose of rubella before January 1, 2010, the doses will be accepted as compliant to immunization requirements and 2 MMRs are not required. 3.03 Every child must have received all of the vaccines, be in-process of receiving needed doses listed in Table 1, show proof that they have a letter from the Arkansas Department of Health approving serology as proof of immunity, or applied for an exemption for those vaccines he or she has not received in order to continue attendance in a public school. If the child does not meet the immunization requirements for entering a public school, refer the child to a medical authority (private doctor or health department) for immunization or consultation.